NO DUPLICATE VARIETIES: Packages up to 30 succulents will not contain more than 1 of any given cultivars. 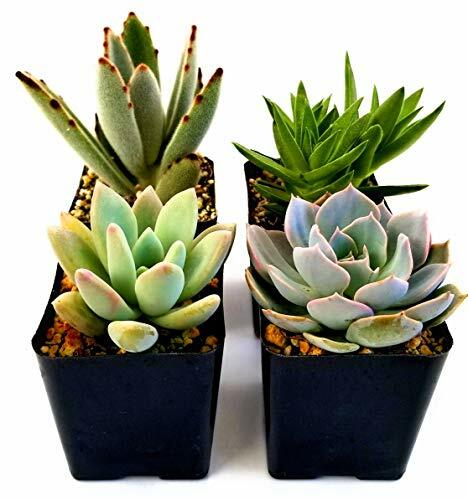 Unique and healthy succulent plants are hand selected from our greenhouse the day they ship, minimalizing the time spent in a dark box. We do not guarantee the exact plants in the product photo as our selection varies based on time of year, temperature, availability, health and size of the plant. EASY TO CARE FOR: Succulent plants require minimal care. Bright light, well-draining soil and minimal watering is required to keep your succulents happy. Most do well in temperatures that do not drop below 40 degrees as outdoor plants and almost all will do well indoors with bright light from a window or a grow lamp. Our plants are greenhouse grown and will need to acclimate to full sun, please refer to our free e-book that accompanies each order for more information. 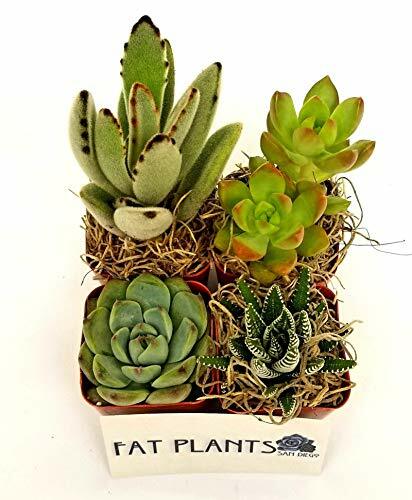 SHOWERS, WEDDINGS, GIFTS, PARTY FAVORS: Our 2 inch fat plants work great for wedding or home décor, shower decoration or party favors. Use these miniature plants as place settings, take-away gifts or just to brighten up any room. DISH GARDEN PLANTS: Cactus and succulent plants make excellent dish garden additions, bring life to fairy gardens, and are therapeutic. Watch your children plant their own gardens and learn about succulents as they grow, flower and duplicate. Most succulents are easy to propagate and a fun and exciting way for kids to learn about plants. FAT PLANTS SAN DIEGO: a family owned, California licensed nursery and grower.